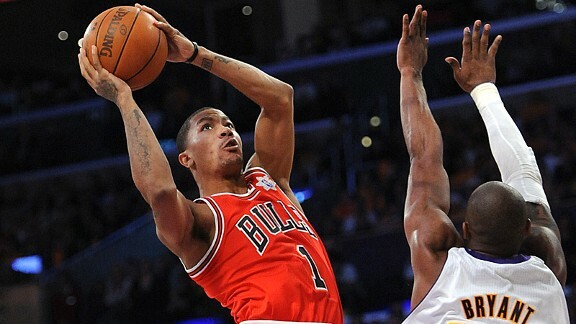 Some might say that the Los Angeles Lakers pushing the Chicago Bulls to the limit last night, losing only to Derrick Rose’s jumper in the final seconds, despite not having Andrew Bynum, means they’re going to be fine. Later on, Kobe Bryant’s failed attempt to win the game on his own showed that it probably won’t be. The Lakers played good defense on the best regular season team in the league last season.They built a decent lead in the fourth quarter after the Bulls dominated in the first half. Kobe Bryant was everywhere, finishing with 28 points, 7 rebounds and six assists. But he was on his own. Andrew Bynum, with so much hinging on his health and ability to level up this season, is out on suspension. Pau Gasol looked like he did in the playoffs last season. So it’s up to Kobe Bryant, who nearly won it by himself. The last move, with Bryant going up against four Chicago Bulls players instead of trying to think of anything other than just winning it by himself could be repeating itself quite a lot this season. In my opinion, Bryant is close to the point he was a few years ago, the 2004-2007 period. When Kobe didn’t trust anyone on his team to finish the job but himself. It looked that way last night. For Chicago, it’s a different story. Derrick Rose is undoubtedly the leader and best player. An MVP, young as he is, has to be. But he doesn’t force himself on the game, finishing with 9-13 from the field, 22 points and 5 assists. He did turn the ball over five times, but turnovers (Bryant had 8) are bound to happen plentifuly after the lockout and lacking preparation. Still, the Bulls won with great team defense. Luol Deng managed to score 21 points, grab 7 boards and get four steals with excellent crunch time defense on Bryant. Joakim Noah struggled, but Carlos Boozer, Taj Gibson and Omer Asik did a good job in the paint when it mattered the most. The Bulls are probably the second best team in the East right now. As of yesterday, the Lakers are the second best team in Los Angeles. Mike Brown needs to do a lot of work on the offensive end that doesn’t include Kobe Bryant for that fact to change.